Remember a few weeks back we made Rainbow Rice! That was a great project and the boys loved the outcome! They have been staring at the bag of rice for weeks asking me to play with it, but I kept telling them I have a plan! My plan? An I spy bottle! Inspired by Pink & Green Mama, I knew I was going to have to do this project. 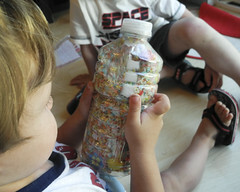 Step 1: Find lots of little toys and miscellaneous items that will fit inside your bottle. Take a photo and print it. Step 2: Insert your items into your bottle. 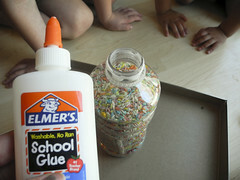 Step 4: Add a good glob of glue around the threads of the bottle and close lid tightly. 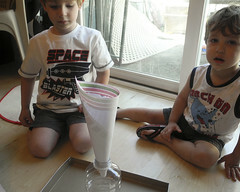 Step 5: Shake and explore. I really like games like these because sometimes Zane needs something to help him sit and relax. He loves I spy books and just staring at the pictures. 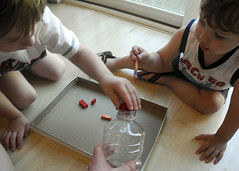 Have you made an I spy bottle for your kids or just for fun before? What do you think about making mini versions of this for Christmas stocking stuffers.